A Vitamix makes finely chopping cabbage quick and easy. I wrote about this technique a while back in a post about coleslaw. 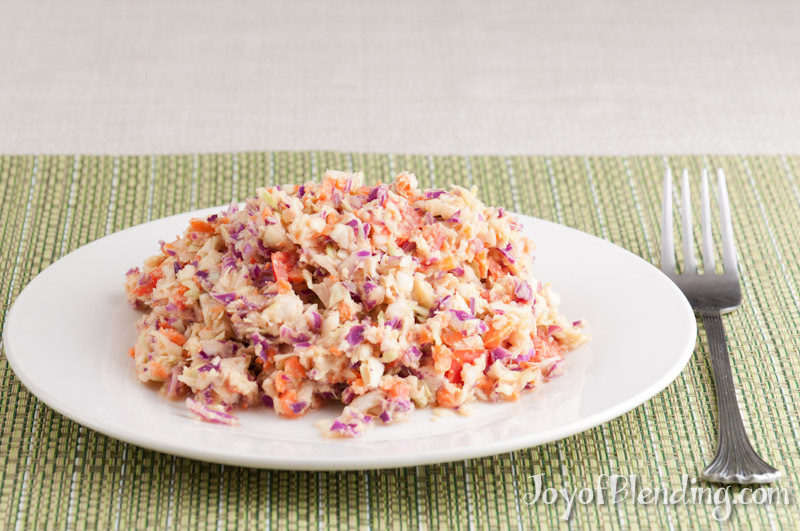 Preparation-wise, this recipe is nearly identical to the coleslaw, but the taste is completely different because of the dressing. I “wet chopped” the cabbage and “dry chopped” the carrots and peppers (more details below). The amounts of ingredients in this recipe are flexible; add more or less to suit your taste. Other possible additions for the salad include: chopped peanuts, sesame seeds, radishes, cilantro, red or green onion. For the dressing: ginger, hot pepper, lime juice. You can mix up the dressing in a bowl if you want to mince the garlic by hand, or you can blend it. If you’re starting with whole peanuts, blending will be necessary. 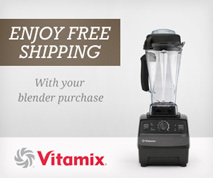 This volume is about the minimum that will work in a narrow container (3″ blade). If you blend it, I recommend cutting the garlic clove into a few pieces. Add all the ingredients except the garlic, start the machine and turn up to speed ~8 then drop garlic through the hole in the lid. (That should keep a large chunk of it from getting stuck under the blades, which can happen with this sort of small volume blend.) If you only have a wide G-Series 4″ blade container, you will either have to increase the amounts or mix it by hand because it won’t be enough to blend well. To dry chop the carrots and bell pepper, first trim off the tops and remove the seeds of the pepper. If you have a classic-style machine (variable speed and high-variable switch on the left), set the speed to 5. If you have a newer-style machine with a pulse switch on the left, set the variable speed to 21. Turn the machine on and drop large pieces through the hole in the lid into the spinning blade. Dump/scrape the cut bits out. To make it easier to get the last bits, you can run some water into the container, then pour it through a strainer. To wet chop the cabbage, cut it into ~2 inch chunks and put it in the container—don’t fill past ~2/3 full; if you have more, you can do multiple batches. Then add water until the cabbage starts to float up off the blades. Put the machine to max speed, then pulse a few times until the cabbage gets to the size you like. Two short pulses is probably enough. Do not run the machine for more than a few seconds, because then your cabbage will be liquified. Then pour it out into a strainer. Serve it up and enjoy! We had some leftovers that were still good the next day.